As of October 1, the Illinois State Board of Education has reported more than 1400 unfilled teaching positions across the state. For decades, trends have suggested that Illinois, among other states would find itself in this slump. And it’s true: tens of thousands of positions remain open across the nation this school year, our region included. Schools in Champaign and Ford counties reported 24 open positions at the beginning of the month. Schools across the country are asking what they can do to fill these empty positions and retain the talented teachers they hire. The reasons teachers are leaving the classroom run the gamut: from salary to family and administration to geography. Some of these factors are outside the school’s control, but some systems, such as instructional coaching, can provide essential support to teachers to increase retention rates. Teaching can be an isolating experience. Teachers spend the majority of their day with children and have regimented restroom breaks, lunches, and prep periods. And the job doesn’t stop when the 3:00 bell rings. It’s demanding. Teachers stay after school to prep, to plan, and to coach. Many teachers spend their evenings grading tests and projects at home. Time is especially valuable, which is why many of them spend their “free” periods at school alone, trying to get ahead or trying to catch up. Opportunities for convenient, effective, efficient, and collegial professional experiences are limited. Ideally, instructional coaching overcomes these barriers. At it’s best, coaching shouldn’t feel like another item on a teacher’s to-do list. It should be worthwhile. It should help teachers improve their practice, build confidence, increase student engagement, and raise student achievement. By and large, teachers feel personally responsible for their students’ learning - and they should. When teachers feel effective in the classroom, they also feel satisfaction. Teachers who are happy in their jobs are better teachers for it. Coaching provides teachers a safe space to explore what could be different and what could be better in their classrooms. 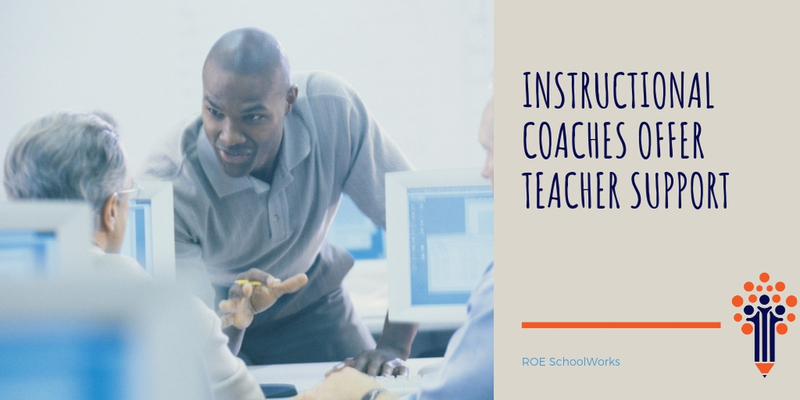 Coaches connect teachers with resources and strategies and imbed ongoing professional development in the classroom. Numerous studies have shown the effectiveness of instructional coaching on student achievement, and several studies--here’s one-- have suggested support programs, like coaching, as a method to retain teachers. Although instructional coaching is a fairly new idea, it’s catching fire. Schools are learning that ongoing, imbedded professional development provides a high transfer rate. When we support our teachers in the classroom, we value them and, in turn, we value our students. What better way to be stewards of our children than to invest in their teachers and their education? What better way for schools to support their teachers and retain them?